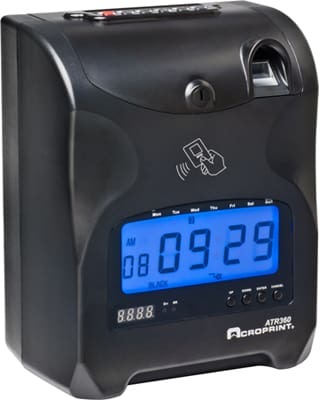 The Acroprint ATR240 time clock is a top-loading punch clock that uses familiar time cards for record keeping purposes and offers a biometric fingerprint scanner to eliminate costly “buddy punching.” Employees simply press their enrolled finger against the fingerprint scanner on the ATR240. Once their fingerprint has been scanned and accepted, the time will be printed on their time card. If you prefer to use badges, the ATR240 also includes a proximity reader that allows the use of either proximity badges or convenient key fobs to identify employees. Once their badge or key fob has been read and accepted, the time will be printed on their timecard. The ATR240 offers the same basic features as the ATR360, without the biometric or proximity readers. Both the ATR360 and the ATR240 feature a large backlit digital time display, two-color printing and a built-in musical chime. These clocks automatically adjust for Daylight Saving Time changes and can optionally be equipped with a battery backup to allow punches even during a power failure. Proximity reader uses badges or handy key fobs to idenfity employees. What are the advantages of biometrics? Each year, “buddy punching” costs employers thousands of dollars. Buddy punching, or “time theft,” occurs when one employee clocks in or out for another who is not present. The result: absent employees get paid for time they are not working. A 2008 Nucleus Research study revealed at least 19% of employees admit to participating in the practice. Biometric verification can virtually eliminate buddy punching, but has traditionally only been available on computer-based time tracking systems. 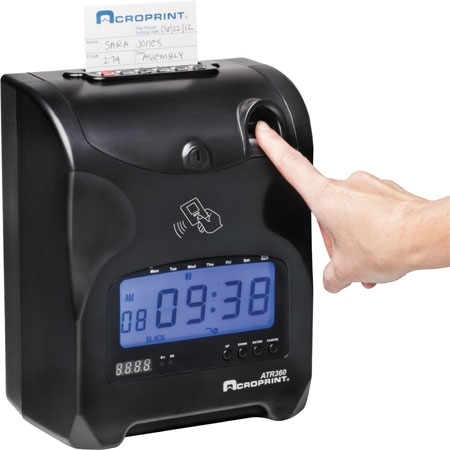 Now, the innovative ATR360 time clock allows employers who prefer to use traditional time cards to enjoy the money-saving benefits of biometric verification, all with one self-contained time clock. There is no PC required and no software to install. If you prefer, the ATR360 also includes a proximity reader that allows the use of either proximity badges or convenient key fobs to identify employees. This can also go a long way toward eliminating buddy punching. Once the employee's badge or key fob has been read and accepted, the time will be printed on their timecard. Upgrade your time tracking to the ATR360 today and enjoy the peace of mind offered by reliable biometric and proximity technology.